In the last two pAsurams, maNavALa mAmunigaL described about the choices blessings of his own AchAryan in thiruvAimozhip piLLai and paramAchAryan emperumAnAr. Against the backdrop of the mercy of these two, maNavALa mAmunigaL is very sure that their blessings will not fail, ensuring his ascent to paramapadham and enjoy the Lord there. maNavALa mAmunigaL expresses his desire to go there as soon as possible to enjoy the Lord who resides in the “dhivyasthAna maNdapam” (the divine altar) and is seated in the “dhivya simhAsaNam” (the divine throne of the Lord). nAn anubhavikkum vagai nalgu en ethirAsA!!! en ethirAsA – Oh! yathirAja! my master! The leader of yathis!!! idavarugum irukka – on the left side. In this pAsuram, maNavALa mAmunigaL asks SrI rAmAnuja to bless him so that he can go to paramapadham and enjoy srivaikuNtanAthan as soon as possible without any delay. 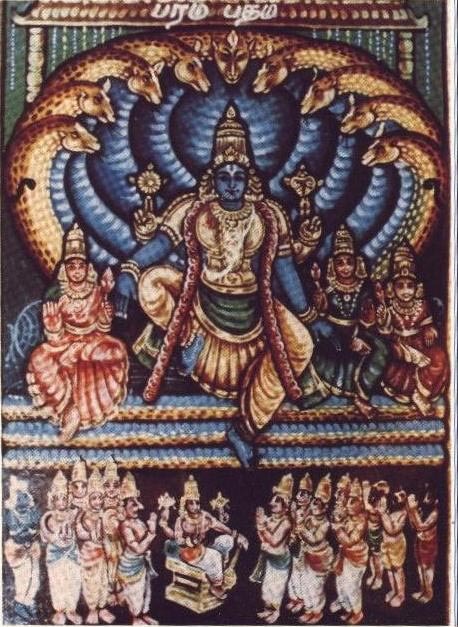 maNavALa mAmunigaL describes SrIvaikuNtanAthan as the one who is seated amidst his divine consorts of periya pirAtti, bhUmi dhEvi and nIlA dhEvi in the thirumAmaNi maNtapam amidst the glorious line of nithyasUris including ananthan, garudan, vishwaksEnar as well as mukthAthmAs that includes AzhvArs and AchAryAs. maNavALa mAmunigaLL says, “Oh! My master! The leader of yathIs (sanyAsis)!!! The nithyasUris are the mukthAs are all beautifully lined up as they say “adiyArgaL kuzhAngaL (thiruvAimozhi 2.3.10)” and “mAmaNi maNtapathu anthamil pErinbaththadiyAr (thiruvAimozhi 10.9.11)”. The nithyasUris include the likes of anantha, garuda, vishwaksEnar etc., whereas the mukthas include the likes of parAnkusa, parkAla and yathivarAdhigal. These devotees are beautifully lined up that it looks like a beautiful garland of pearls and gems decked together. They are lined before the resplendent, that which radiates infinite happiness and that which is known by the name of “thirumAmaNi maNdapam” as per “AnandhamayAya maNdapa rathnAya nama:”. In this maNdapam is the great serpent bed called “ananthan” who is synonymous with “eternal service to the Lord” and one who is unparalleled in softness and coolness. “ananthan” is described in numerous places including, “Ayiram painthalai ananthan (periyAzhvAr thirumozhi 4.3.10)”, “siRappudaiya paNangaL misaichchezhumaNigaL vitterikkum (periyAzhvAr thirumozhi 4.9.7)”, and “dheyvachchudar naduvuL (periya thirumadal 1)”. periya pirAtti is someone who is identified with her quality of beauty and soft nature as seen in the phrases like “vadivAy nin vala mArbinil vAzhginRa mangai (thiruppallANdu 2) and “vadikkOla vAL nedunkaN (iraNdAm thiruvandhAdhi 82)”. She is seen at the right hand side of SrIman nArAyaNan. On HIS left side are the bhUmi pirAtti and nIlA dhEvi who are the shadows of periya pirAtti. Sriman nArAyaNan is seen between these three pirAttis like a a lotus like dark rain bearing cloud is seen with three beaming streaks of lightning. HE is known as SrIvaikuNtanAthan who is described as “vAzhpugazh nAraNan (thiruvAimozhi 10.9.1)”, who is seated there to rule over the worlds (“vIRRindhu yEzhulagam thanikkOl sella (thiruvAimozhi 4.5.1)”. Oh! My master ethirAsA!!! Please shower me with your choicest blessings for me to immediately enjoy such a SrIvaikuNtanAthan”. This entry was posted in Arththi prabandham, Other and tagged arththi prabandham, emperumanar, mamunigal, ramanuja on September 14, 2016 by santhanam rajagopalan.